A blouse alone cannot make a huge impact as it would be able to do with the right jewellery. So, find the perfect jewellery that suits the trendy blouse designs you have. Blouse trends have come and gone through the years. Though there are some design trends that have come to stay, which are better known as the classics. But blouses alone are not what make an outfit. To make a blouse even more memorable, you usually have to add something to it. This something is your jewellery, you would notice that the right jewellery makes sure that you just don’t look trendy but it completes your outfit. This is especially true for Indian clothes, we have seen that a simple pair of Jhumks can make us feel and look more delightful than maybe a simple kurta. While wearing trendy blouse designs that we have nowadays, we need to make sure that our jewellery too is as trendy as all of it. It need not be fully contemporary, but it needs definitely increase the impression of your trendy blouse design. And to help you with any ideas you might want, we bring you some of these combos that we found striking. Though a Manish Malhotra design looks as good as the name suggests, this stunned and tasselled blouse is definitely unique. Adding to this trendy blouse design are the earrings here, which a shade of colour that pops against the monotone shimmery silver that Kiara Advani chose to wear on Priyanka Chopra's reception. This look would suit brides who want a modern look, they could wear it for the Sangeet or the engagement. If brides want a look in the same tone then they could opt for a piece of similar and more modern jewellery than the pearl earrings. Since off-shoulder blouses are a contemporary concept and the jewellery set the bride is wearing is a through and through a traditional set, this dual tone for the bridal look really sits well. A bride can wear these for her reception, an appropriate function as it is also a mix of tradition and contemporariness. Since your blouse and jewellery are so striking, make sure as not to overdo your makeup here. An outstanding part about this blouse is that you would not realise in the first glance that she does not have a necklace. The jewelled neck is so perfectly in sync with her jewellery that you cannot tell the difference. The reception or the Sangeet would be a perfect place to show off this trendy blouse design that you have. Here you can also go for small stud earrings rather than big ones, as your neckline does look heavy enough. Looking at the bride and her get-up, this is as traditional as you can get in both jewellery and blouse. Though the trendy blouse design has a little modern edge, the colour is absolutely classic in nature. The purely traditional jewellery and blouse can be enhanced if you maybe use one modern piece of jewellery with it. This would suit brides as their wedding day outfits. When you wear clothes and jewellery, it is a lot of fun to mix and match, similarly with this tassel blouse and Kundan necklace, which though are extremely dissimilar in nature, look put together as if it is meant to be. A bride can carry off this trendy blouse design and jewellery for her mehndi function and could add a pair of earrings for more bling. Go for a typical heavy work trendy blouse design with elegant diamond jewellery. The silver jewellery with a dark background would make both your clothes and your jewellery look even richer. Don’t hesitate to maybe mic match your diamond jewellery and not go for a complete set. Wear these for your reception, and you would surely be in the limelight. What looks inspiring here is not the blouse, which is an art in itself, but the two types of necklace that the bride has worn with it. One she has adorned more like a choker and the other like a Haar. Both the contrasting types of necklace, gold and Polka, fit perfectly with each other. The bride should wear this selection on her wedding day. The trendy blouse design and the jewellery both and heavy and rich for them to carry out such an important function. Not all jewellery has to be in gold, silver, or diamond for it to create a beautiful impact. This Gota Patti jewellery with a simple yellow boat neck blouse would look extremely elegant and would be the perfect adornments for your Mehndi function. This would be not neither too heavy, nor easily ignorable, and for brides who do not want anything expensive to get dirty even by mistake, well it is perfect. The bride can let her hair down for this combo, to give in to a carefree look. If you are going for a mirror work blouse with a pretty subdued base colour, then wearing jewellery with a pop of colour would look pretty marvellous. Just as this combination is looking, as the blue stones in the jewellery are enhancing the whole mirror work trendy blouse design she is wearing. A bride could wear a blouse and jewellery like this on her Sangeet or reception. She would truly look different than all others, the only thing to keep in mind is that she does so in a day function. 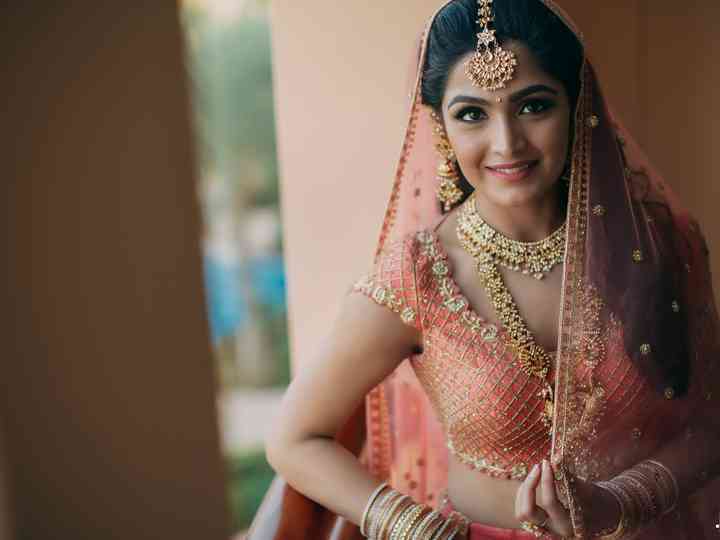 This bride looks so exquisite and elegant, and the jewellery and the trendy blouse design she is wearing just factor into this portrait of dignity she makes. Her deep-v blouse, which is quite stylish and current in fashion does not look at all out of place with the classic jewellery she is wearing, which looks like it belonged to royals. A bride should wear this combination on her wedding day and the impact that it shall have would be second to none. These trendy blouse designs and jewellery are splendid combinations and mixtures that a bride can wear on her D-day or maybe around that time to create an impression on people. Some of them are simple and some of them are more dramatic, but all of these combos are definitely impactful in their own right. Maybe show us some of these awesome combinations you might have seen someone wearing, which can be pulled off by a bride.